Apple is going to introduce iPad in India from friday onwards, where sales would be done through retailers instead of offering service plans by mobile operators. The 3G service to iPad will be provided by Bharat Sanchar Nigam Limited (BSNL) as for now 3G data plans for the iPad will be provided from telecom circles like Chennai, Andhra Pradesh, Maharashtra, Gujarat, Rajasthan, Kolkata and UP. 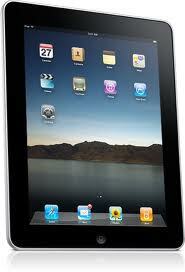 The iPad comes with dual camera, high resolution display and with faster processor. The available capacities are 16 GB, 32 GB, and 64 GB either as Wi-Fi only or Wi-Fi with 3G. While considering the price 16 GB with only Wi-Fi version is for Rs 27,900, 64 GB Wi-Fi with 3G is for Rs 44,900 and while we look at the data plans like pre-paid with 6 GB will cost Rs 599 for a month and if the limit is exceeds it will cost 1 paise for each 10 KB, the other plan is for Rs 999 with unlimited browsing, and there is a plan for people who use 3G rarely that is for Rs 99 /day. And these plans are not for contract so you can activate or cancel it any time.